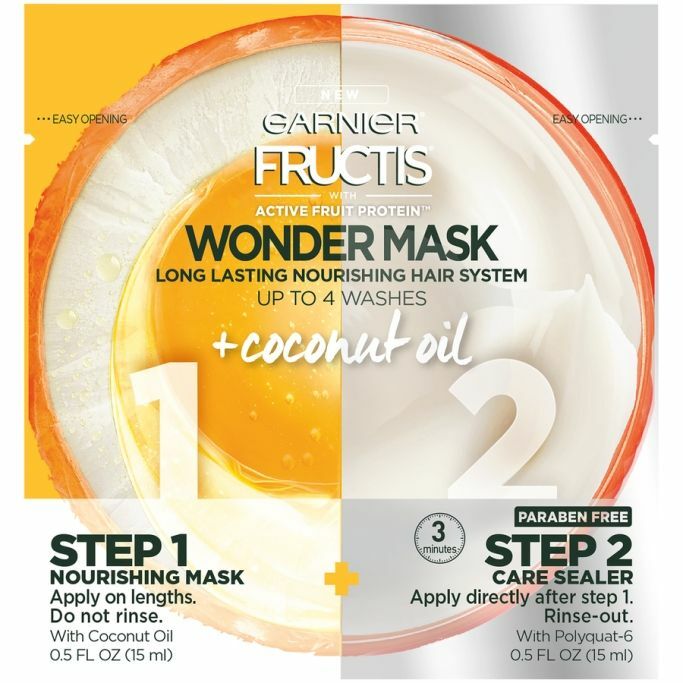 Garnier Fructis has created a hair mask that works and feels as indulgent as a great face mask (and it's under $3!). 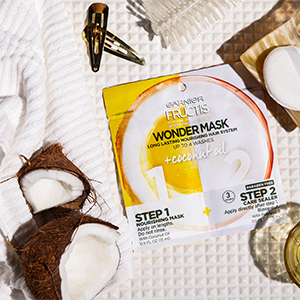 The Garnier Fructis Wonder Mask Coconut Oil is a two step mask with Coconut oil to nourish, hydrate and soften hair, and a "sealing" product made with Polyquat-6 which works to continue conditioning hair for several more washes. Working with the two steps was easy and even though it took another few seconds to apply, I loved feeling like I was locking in the conditioning effects of the first hair mask. After applying the second step, waiting the recommended 3 minutes (and did all my other beauty steps in the shower) and then rinsing, I could immediately tell that it had penetrated my hair. It was soft and smooth with no tangles right out of the shower. When I blow dried my hair, it the brush glided through my hair much easier and there was very little breakage. My hair continued to feel soft and smooth throughout the week. when I did my next shampoo, I decided to use a cleansing conditioner only to test out their lasts up to 4 washes claim. I dd continue to feel the soft, smooth finish on my hair, and my hair didn't feel as dry or parched, not following up with an additional conditioner. For me, I felt like by the 3rd wash, I did need an additional deep conditioner, and used another Garnier Fructis Wonder Mask Coconut Oil treatment post shampoo.